The best part of my dayis when I walk through my front door after spending 8 hours at work. Being home is heaven and I want to make the transition from the business world to my haven feel special. Crossing the threshold starts the transformation, but I like to make a celebration out of the end of a long, hard day with a simple ritual to wash away my troubles. I take off my coat and drop my tote bag on the mudroom floor, then immediately go to the kitchen sink and fill it with warm water. 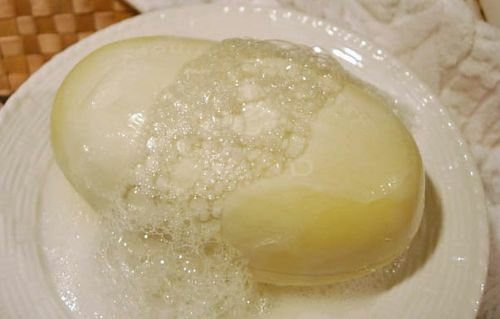 I have a bar of beautifully scented soap waiting on a pretty pedestal ready to rinse away the tensions and I let the 9 to 5 go down the drain, along with the days grime. Not only do my hands feel renewed, but my soul is ready to greet the people, pets, and the possessions I love with enthusiasm. It is the start, my second chance to have a fresh new beginning to my day. 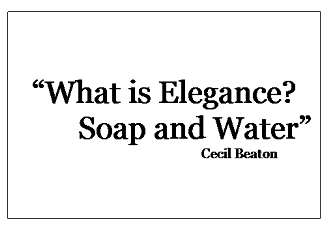 Filed Under: Daily Life Tagged With: Famous quotes, What is Elegance? Stopping by from SITS and wishing you an awesome day!!!! What a great way to begin your evening clean and new! I really like this. What a great to feel refreshed and new and ready to enjoy your home!